The debts of Asfinag are still increasing, but only slightly, and not nearly as much as originally planned. 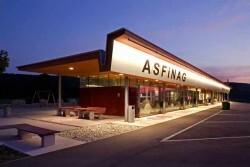 Within 25 years Asfinag could even end up debt free, according to the long-term prognosis. The restructuring program is made possible by higher revenues and stopping various projects. Toll revenues increased from € 1.4bn (2009) to € 1.5bn (2010). This year the proceeds from tolls are also expected to amount € 1.5bn. Toll revenues for trucks increased from € 0.93bn to € 1.03bn. The revenues from vignette sales remained stable at € 355m, as well as other revenues for € 124m. The equity base could also be improved, rising from € 1.9bn to € 2.2bn. The tendency is to perpetuate itself for 2011: equity amounting to € 2.5bn is being planned. Liabilities are also still on the rise. In 2009 they amounted to € 11.3bn and they grew in the last year to € 11.9bn. In 2011, debts are expected to grow slightly to € 12.0bn. According to Asfinag the additional debt in 2010 is due to the A5 highway project, a decision coming from the ÖVP-FPÖ government. A savings program is expected to succeed rising the debt to € 14.2bn by 2019 instead of € 17.8bn. As a result, a debt reduction is expected by 2035. Otherwise, repayment would have taken 43 years. The investment program was also driven back. In the period 2011 to 2016, planned investments were reduced by € 2.8bn to € 6.5bn.